I tend to gravitate toward greasy sandwiches, cheesy pastas, and hearty meat dishes. Anything that can be whipped up easily and can be stretched across a few meals is ok in my book. I no longer have patience for kale salad or healthy grilled shrimp. Luckily, fall and winter clothes are a little more forgiving. It’s much easier to cover up that muffin top or belly bulge with a flowy sweater or a fitted blazer, but honestly, who wants to have to cover anything up? I know I don’t. So that’s where this soup fits in. It fills all of my requirements for a dinner rotation staple. It’s easy. It’s filling. It’s healthy. It’s cheap. And it freezes well. Really, what more could you ask for? To make the soup: Heat the olive oil in a large heavy-bottomed pot over medium heat. Add onion, cover, and cook until translucent, about 8 minutes. Add cauliflower, parsnips, bay leaf, and vegetable stock. Bring to a boil. Reduce heat and simmer gently for 30 minutes, until vegetables are tender. Remove bay leaf. Purée using an immersion blender or regular blender. Season with salt and pepper. 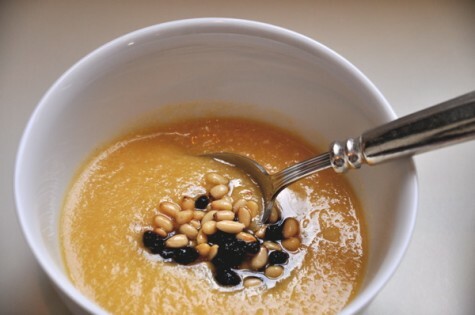 To make the garnish: Mix pine nuts, currants, olive oil, and thyme in a small bowl. Season with salt and pepper to taste. To serve: Ladle soup into large bowls. Sprinkle 1 tablespoon garnish in each bowl. Serve with crusty bread. I’ve never cooked with parsnips before, but I’ve always wanted to. This looks like a great way to start! Heya i will be for the first time the following. I came across this aboard and I find It truly beneficial & this solved the problem out considerably. I am hoping to offer some thing rear along with support other folks as you taught me to be. I wouldn’t look. She tended to trek in an ambience of artifacts about to take place. Minnie Should is awful sick-she’s got croup. Do not you, Jane? This is really a wonderful site, could you be interested in making time for an interview about just how you designed it? If so e-mail me and my friends! My spouse and I stumbled over here by a different web page and thought I might check things out. I like what I see so i am just following you. Look forward to looking at your web page for a second time. Yum! I bet I could do something similar in the crockpot–you can bet I’ll be printing this out and experimenting. Fall is my second favorite season, almost solely because I get to eat these kinds of comforting foods nonstop. Thanks for posting! 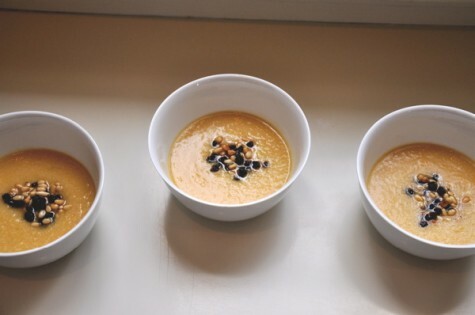 The cauli parsnip soup is just a riot of flavor! I served it up for appetizers just before the roast and goes righteously well with white wine.